A.R. 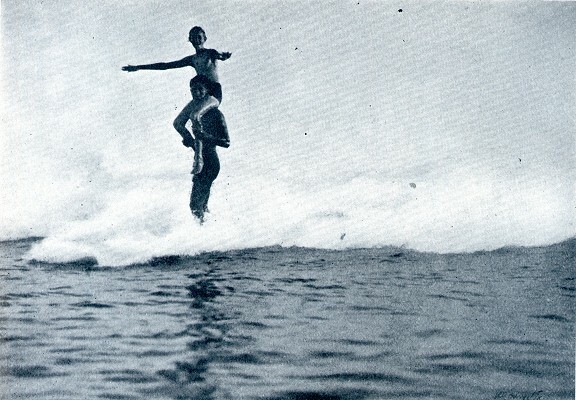 Gurrey Jr. : Surf Riders of Hawaii, 1915. Volume XLII, August, 1915, pages 923-927. These photographs were originally printed as a collection by A.R. 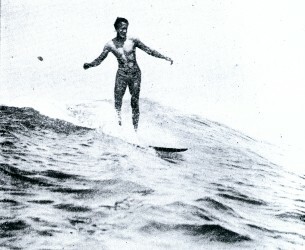 Gurrey Jr in his self-published The Surf Riders of Hawaii, circa 1911. Each copy consisted of a varied selection of eight untitled hand-printed photos on pasted boards, with one page of descriptive text and one with a stanza from Byron's poem Childe Harold. The 1915 article reproduces the text and poem, however it has two extra photographs. Each page assigns coyright to A.R.G., JR.; and each page and image has its own black line border, not reproduced. The uploaded images are scaled approximtely to the size as printed, and I have assigned the numbers and titles in [brackets]. 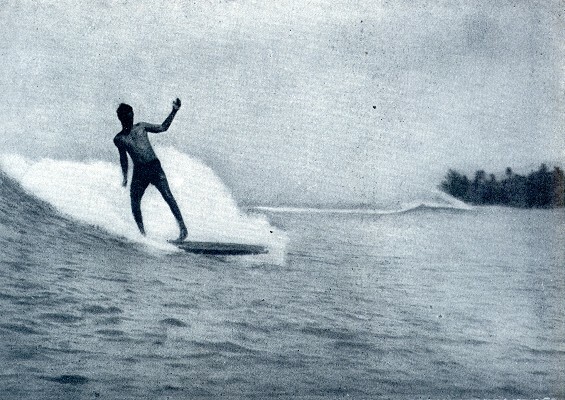 This was not the first surf riding article in St. Nicholas, Alexander Hume Ford's article on Pacific sports and games, A Boy's Paradise in the Pacific, was featured in the August 1908 edition. 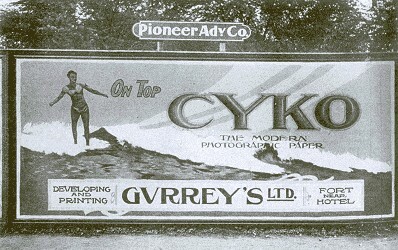 Some of the images appeared in other publications of this period, notably photograph 5, Duke Kahanamoku at Waikiki, which was used extensively in advertising for Gurrey's Honolulu photographic studio from the end of 1910. It was printed on the cover of the first edition of The Mid-Pacific Magazine in January 1911, and as the frontpiece of Volume 2 Number 2, with the stanza from Byron's Childe Harold. The photograph was possibly the template for a coloured illustration used by the Hawaiian Promotion Committee to publicise their Floral Parades and Mid-Winter Carnivals 1911-1914, and later appropriated to promote Duke's tour of Australia in 1914-1915. 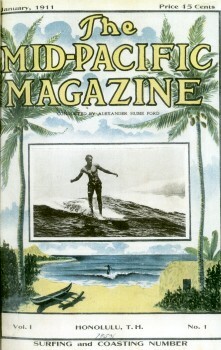 The first edition also printed a photograph, Riding the Surfboard at Waikiki Beach, illustrating a tandem shoulder carry, "Copyright 1910 A.R. Gurrey Jr.," very similar to photograph 6. 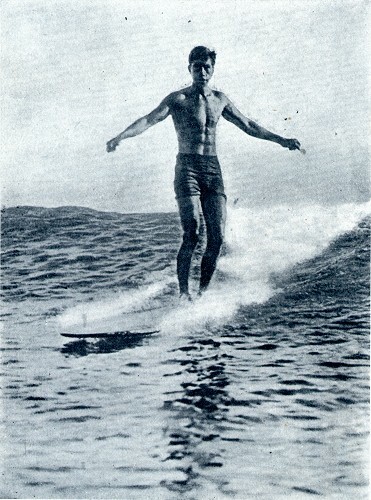 In 1912, The Mid-Pacific Magazine published photograph 3 in Volume 4, Number 5, titled "Duke Paoa Kahanamoku, Hawaii's Champion Swimmer of the World," with copyright by Gurrey. As most photographs indicate that Duke was a natural-footer, here he is riding goofy-foot, or rather switch-foot (unless the negative was flopped). This may have been to advantage the photographer, the most dramatic shots are those with the surfer facing the camera, ideally framed by Diamond Head, as in photographs 1 and 10. Photographs 1 (heavily cropped) and 7 were reprinted, in what was probably a syndicated article, by the Dakota County Herald, September 10, 1914, page 3. Photograph 1 was printed in a National Geographic Magazine article, The Geography of Games, in August, 1919. The rapid adoption of Kodak's Box Brownie is perhaps illustrated by the numerous photographs (along with illustrations, poems, and stories) contributed by younger readers for awards in The St. Nicholas League. 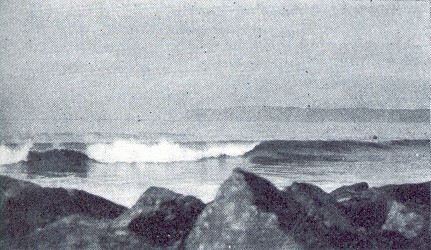 For example, the, The Water at Twilight (a photograph of a breaking wave) on page 945 by Dorothea Setzer of Michigan, aged 11, who was awarded a silver badge. As the great ocean roll strikes the reef at Hawaii, all the force arid energy of a thousand miles is halted in its course. Maddened at its unknown foe, it throws its billowing form headlong over the reef; boiling and churning it rushes along, dissipating its strength in the quiet pools until at last it dies, a mere ripple, on the beach. What are those swiftly moving forms gliding over the surface of the foam-specked waters like a school of dolphins- their bronze bodies glistening in the sunlight? Are they a company of sea-nymphs or mermen? They are a merry band of water-lovers- the Surf-riders - and no legendary water-sprite ever rode the waves with more joyous abandon than these. Far out at sea, there is a faint unevenness silhouetted against the sky. The watchful eye of the boy has seen it- you hear a penetrating, low, weird whistle- the signal that a "big one" is coming. Outstretched on their boards they sweep the water with their hands, mounting wave after wave, gliding into the glittering troughs beyond, until they reach the reef. It strikes- arches, curves, and falls! And as it plunges forward, like a frightened sea-horse, this fearless surf-rider is at its mane. With board pointed shoreward he rides this untamed fury. He stands erect with arms outstretched, triumphant, with a glittering inclined plane before him. On, on he sweeps, tobogganing in an opalescent sea, plowing up showers of liquid jewels into the sunlight. The wave is spent, the rider drops astride his board, and, with the grace of a sea-gull turning in its flight, he heads for the reef again. Thus plays this child of the sea, happy and care-free, until the great orange sun drops below the horizon. By Dorothea Setzer, age 11, Michigan. 8 surfing photos, that vary between books. 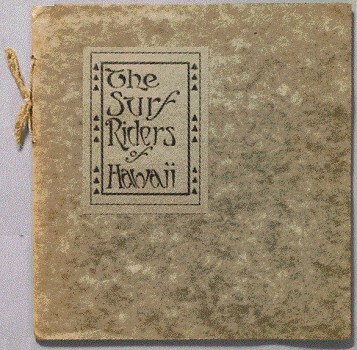 The first surfing book, self-published with hand printed photos on boards. 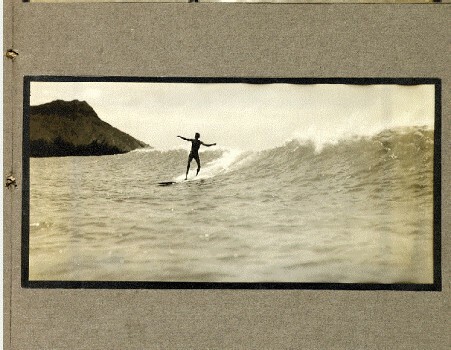 Photos of surfing at Waikiki with short text on surfing and a stanza from Byron poem "hand printed photos on boards. ", and ends with a photo of Duke. 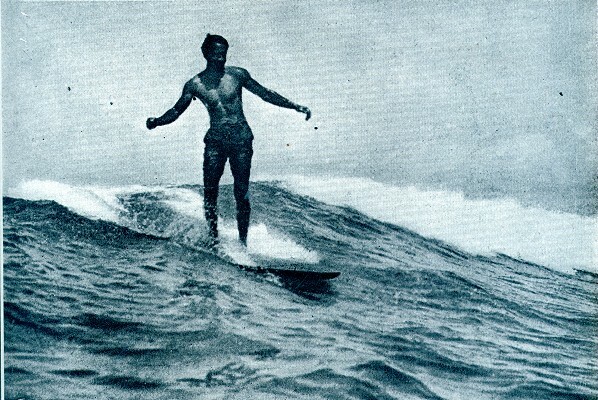 Gurrey who surfed and pioneered water photography is credited as the first surfing photographer. "The Bishop Museum copy is very different as can be seen by this list. We only have single photos per page; no doubles. And no blank pages either. Ours also appears to have only 3 of the same photos as the listing in the message below. Duke (presumably) with arms partly out, with Diamond Head in much of the background. Gurrey Jr, A.R. 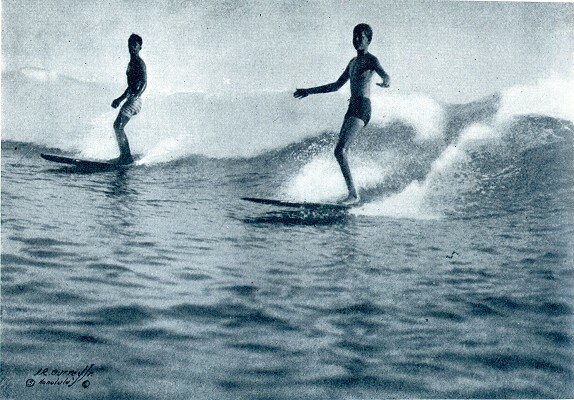 : Surf Riders of Hawaii. Image courtesy of Scott Emerson. Desoto Brown: "Full-length, fairly close view of Duke on board with his arms out (as used in Gurrey's ads) (listed below on p. 11)"
Volume 1, Number 1, January,1911, page 133. Volume 1, Number 1, January,1911. 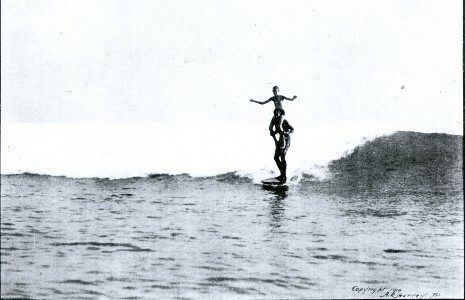 Desoto Brown: "Duke (presumably) with boy on his shoulders (identified in another copy of this photo in our collection as Charlie Little, listed below on p. 9)"
Geoff Cater (2013) : A. R. Gurrey Jr. : Surf Riders of Hawaii, 1915.